Solihull Sports Injury Clinic looks after all abilities of athlete from children through to the beginner and up to elite athletes. 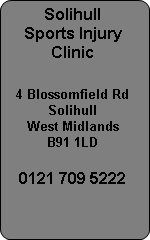 Athletic injuries are diagnosed and treated quickly and effectively at the Solihull, West Midlands Clinic. Top midland athletes Meghan Beesley and Nathan Woodward have been selected to compete for England on many occasions and this dynamic duo are sponsored by Atlas Sports Injury Clinics. Atlas have been looking after these 2 young Olympic Games hopefuls. Meghan collected a silver medal in Delhi Commonwealth Games for her part in the 4 x 400 relay team and a bronze in the 400m hurdles. Nathan is highly ranked in the men's 400 hurdles narrowly missing out in the 2012 Olympics after hitting the last hurdle in the trials. Rio is the next target for these 2 flying machines! Disability Sport is another area where Atlas Sports Injury Clinic feature. Triathlon is an up and coming sport for someone with a disability and British Triathlon Champion Sara Butler recorded a PB time for the Sprint Triathlon at Nottingham when winning the event on Sunday 22 August 2010. Next stop for this visually impaired triathlete is the World Championships in Budapest. Atlas will be supporting Sara over the next couple of years in her quest for success. Clinic Director at Atlas Sports Injury Clinics is Osteopath and Physiotherapist John Williams. John has represented UK Athletics as one of their physiotherapists and is actively involved in promoting sport and treating athletes. Sports Podiatrist Peter Taylor who is based at the Solihull Sports Injury Clinic in Solihull is in charge of the Running Injury Clinic where he uses sophisticated laser scanning technology for measuring the contours of the feet for prescription orthotics. Biomechanical evaluations and prescription orthotic foot insoles can be fitted for athletes, runners and anyone with overpronated feet. Commonly known as flat feet, overpronation is very common in children and temporary orthotics can help the developing child prevent unwanted injuries. Video Gait Analysis is available to assess running gait which can highlight potential problems and reduce the risk of injury in distance runners such as someone training for The London Marathon, Great North Run or Birmingham Half Marathon.